When a madman begins committing horrific murders inspired by Edgar Allen Poe’s works, a young Baltimore detective joins forces with Poe to stop him from making his stories a reality. I had no idea what to expect. But a John Cusack film always creates surprises. Cusack usually doesn’t play in those huge high flyers, but still something always sticks with you. Like “Serendipity”, a teen feel-good movie. And then he surprises like in “Martian Child”. And yes, I thought it was a very strong film where he played Poe the way I always imagined him. A somewhat weird unworldly fellow that writes horrible murder stories. Stories with gruesome murder methods. Guess you have to have a twisted brain to come up with things like that. The setting, atmosphere, costumes and darkness of this time are very good. Indeed, I would have left out the love story because it didn’t gave added value. 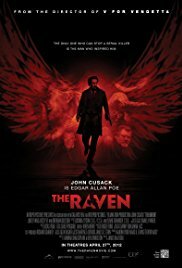 “The raven” felt like Sherlock Holmes meets Jack the Ripper.